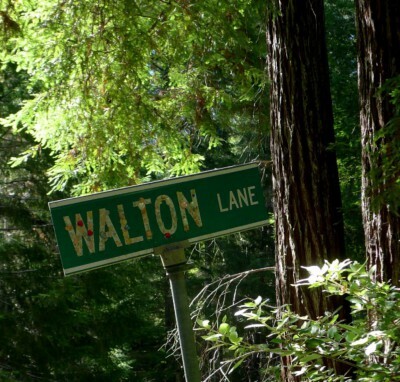 Walton Woods is a week-long summer camp for children between the ages of 6 and 12. The annual camp is operated by Trinity Fellowship Inc., a California non-profit Corporation. Walton Woods Camp is dedicated to providing a simple, old-fashioned, wholesome outdoor experience to young children for a minimal fee. The camp was founded by O. W. Walton, Bill Walker and Don Chase in the early 1970s and has operated every summer since it's founding. The camp is located in northern Mendocino County, situated on 60 acres of private land in a redwood forest, about 10 miles from the ocean. The camp is funded by registration fees and donations from individuals and corporate sponsors. Contributions to the camp through the Trinity Fellowship, Inc. are fully tax deductible. The camp is staffed and operated entirely by volunteers committed to sharing the joy and wonder of the forest with children from all walks of life. Walton Woods is at the end of a dirt road surrounded by wilderness. The property supports one modern cabin, one old cabin, an enclosed camp kitchen and work shed, and an A-frame shelter. There are boys and girls bathrooms with flush toilets, and a fully enclosed hot water “meadow shower”. There is a lake and a year-round stream (Jack-o-Hearts Creek, tributary to the South Fork of the Eel River). The water supply originates from a spring high on an adjacent hillside and is gravity fed from three large storage tanks. In 2010, we installed solar-powered electrical system and batteries; we have a generator for back-up. Refrigeration and hot water heaters for washing are powered by propane. Children, CITs and camp mothers and fathers sleep on a thick carpet of redwood duff beneath towering redwood trees 150 feet tall. Tents and electronic devices are not part of the Walton Woods Camp experience. Meals are prepared by volunteer cooks and consist of three “squares” a day plus snacks. Perishable foods such as meat, dairy and vegetables are purchased the day before camp, with resupplies made during camp to insure freshness. Donations of perishable and non-perishable foods are always greatly appreciated. Everyone eats at picnic tables in the out-of-doors. After each meal, camp families take turns for kitchen duty. Activities include, arts and crafts, hiking, swimming, fishing, learning about forest animals and plants, a day trip to the ocean with a cook-out, field trips, campfires, skits, songs, jokes, stories, games, and lots of laughs and hugs. Activities are planned and executed by our volunteers who provide many of the materials for the arts and crafts without recompense. We have a 1⁄2 acre lake populated by harmless water snakes, dragon flies, a turtle, ducks, trout, tree frogs, newts and salamanders, dragonflies, and from time to time a pair of Ospreys that come to fish. We have a rowboat for adventures on the high seas. The lake has a deep end with a jumping log and a shallow end where the children can frolic and collect lake critters (only to be released unharmed). Children are required to wear life vests and are always supervised when playing or swimming at the lake. CITs are “counselors-in-training”. We recruit responsible Teen-aged kids to help the counselors, and tend to the younger campers in each camp family. CITS share the responsibility of making sure the camp experience is safe and fun and it is our hope that they will return in the future as counselors themselves, continuing the tradition. It is not uncommon for children to start out as campers, returning as CITs, Counselors, and even parents introducing their own children to the wonders of Walton Woods. That’s what makes Walton Woods the special place that it is. Children are divided into “camp families”. Each camp family consists of a camp mama and papa, one or more CITs, and campers. Each camp family is assigned one of six camp sites, which are situated in groves of towering redwood trees. In the morning, groggy children wander down to the kitchen where hot chocolate and a wood stove warm them inside and out. Breakfast is served at around 8 AM, followed by a gathering at the camp stage to discuss the day’s schedule. Tooth-brushing and the ritual “airing-out of the sleeping bags” happen next. Mornings are busy with crafts and activities. Each camp family is assigned one of the activities, which are rotated throughout the week. Lunch is at noon, followed by quiet/nap time until about 2PM. Afternoons are free-form... catching bugs, tetherball, ping-pong, swimming in the lake, guided hikes, running, jumping, and just plain being a kid. Dinner happens between 6 and 7PM. After the dishes are washed and food put away, we gather at the stage for a campfire, skits and songs. More tooth-brushing, then everyone retires with their camp family for a story or two and a peaceful, quiet, delightful night’s rest under the towering redwood trees. And then it starts all over again! We are a 501(c)(3) non-profit California Corporation, Fed Taxpayer ID # 94-6135096 Trinity Fellowship has no particular religious affiliation or purpose.